Jeff Stockham performs on a number of vintage instruments in various settings, depending on the the requirements of the performance. 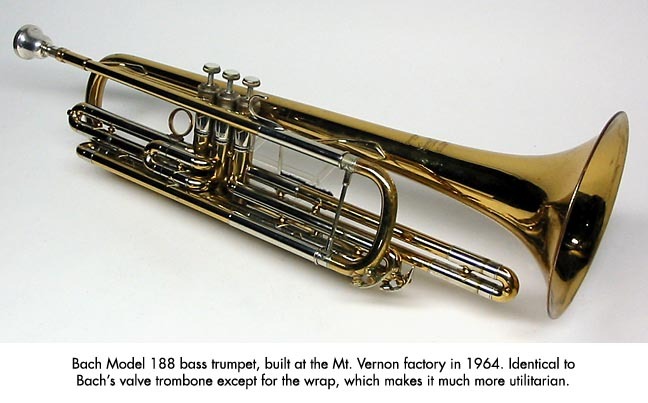 He maintains an extensive collection of vintage and antique brass instruments. 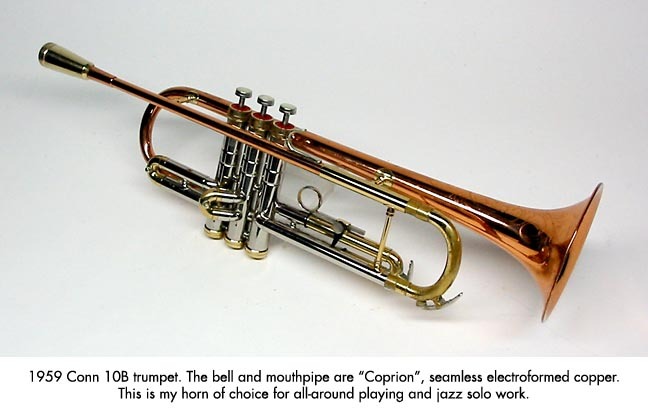 Here are some of his favorite performance instruments, along with his descriptions and comments. Click on the pictures to enlarge. Built in 1959 by Zigmant Kanstul when he was Olds’ French horn builder, this is probably the finest example of this very rare model in existence. According to Kanstul, only a small number of these were produced, and this model had vanished from the catalog by the late 1960s. It is a superb instrument with outstanding intonation and response, and a beautiful yet clear tone that is ideal for jazz. 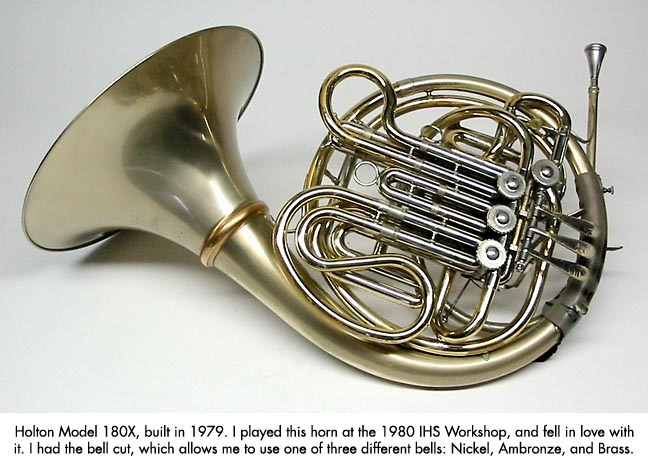 Built in 1979, this horn features a thin, annealed nickel-silver bell, which is interchangeable with a Lawson ambronze bell and a Meinl yellow-brass bell with nickel kranz. The different bells make it a very versatile all-around instrument, adaptable to almost any sort of performing situation. 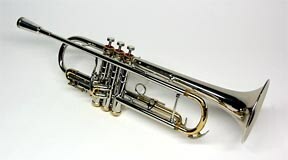 Built in Fullerton, CA in 1959, this Studio model is an excellent horn for lead and commercial work; the nickel-silver flare gives the instrument a very quick and easy response, and plenty of sizzle when needed. 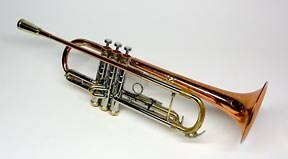 It is also extremely efficient and easy to blow, taking much less effort than most trumpets I’ve played over the years. Built in 1959. 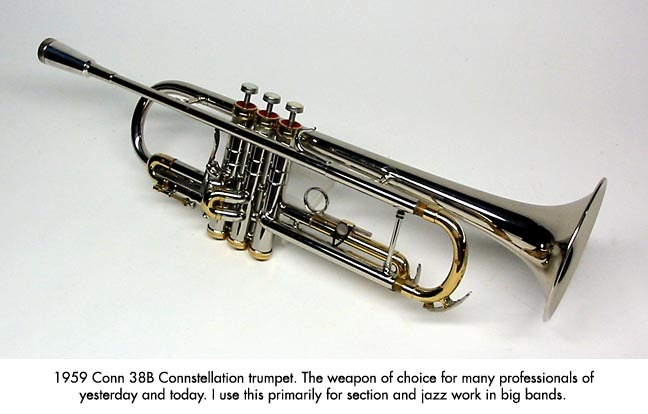 Conn 38B Connstellations like this one were the weapon of choice for many of the great lead trumpeters and jazz soloists of the day, including Maynard Ferguson, Cat Anderson, Chet Baker, Blue Mitchell, and Woody Shaw. 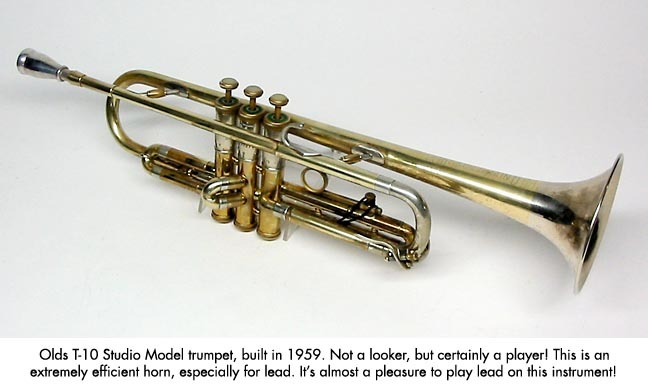 This model is still used today by a number of top players including Tom Harrell and Joe Magnarelli. Built in 1959. The 10B Victor was essentially identical in design to the 38B Connstellation except for having a bell and mouthpipe of “Coprion” — solid copper that was electroformed with no seams. 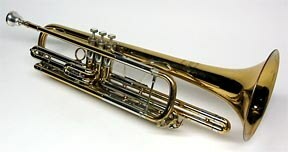 These horns are extremely efficient, and reward the player with a big beautiful tone as well as outstanding projection, and they feel much more open than their small .438” bore would suggest. 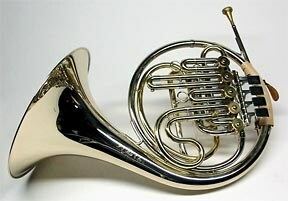 This is my all-purpose horn. Built in 1979. 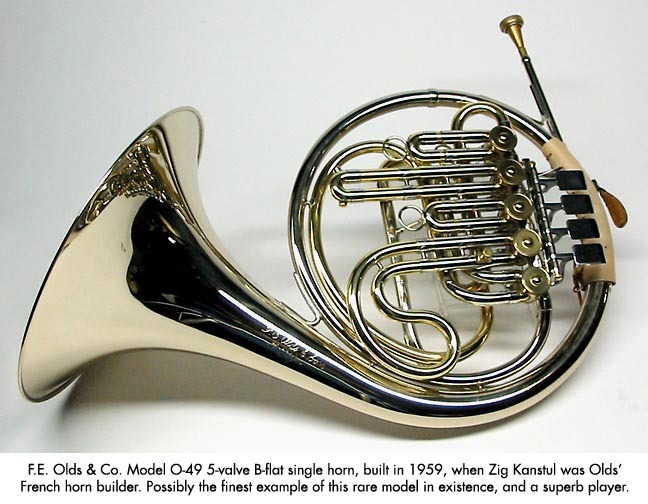 For my money, this is the finest flügelhorn ever built. 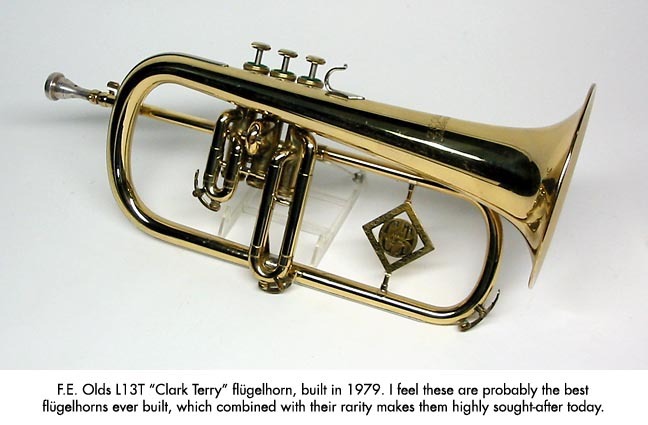 Designed for jazz legend Clark Terry, it has an extra-large bell and a rather over-the-top “CT” medallion. These were produced during the last years of F.E. Olds’ production. They have a big, warm, silky tone, and beautiful response. Built in Mount Vernon, NY in 1964. 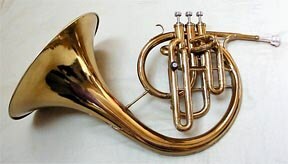 This horn is one of my favorite doubles, combining the utility of a valve trombone with a size almost as compact as a flügelhorn. 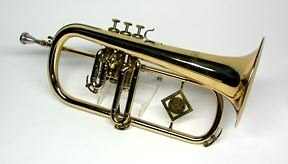 It is similar in playing feel to the smaller-bore Bach trombones like the Model 6. 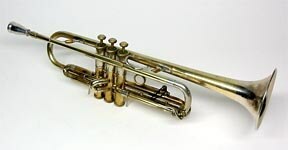 While I do not play this instrument much, it is very noteworthy because it is one of a small number that were custom-built in the 1950s and ‘60s by Conn (at the suggestion of Dizzy Gillespie) for the immensely talented and underappreciated multi-instrumentalist Don Elliott. The bell was put on in backwards fashion compared to a normal bell-down mellophone. Of the four known, Don’s family owns two, I own this one, and the fourth is lost. If you own it or have information on its whereabouts, please contact me. 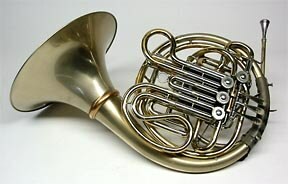 This is the instrument with which I do most of my Civil War brass band performances. 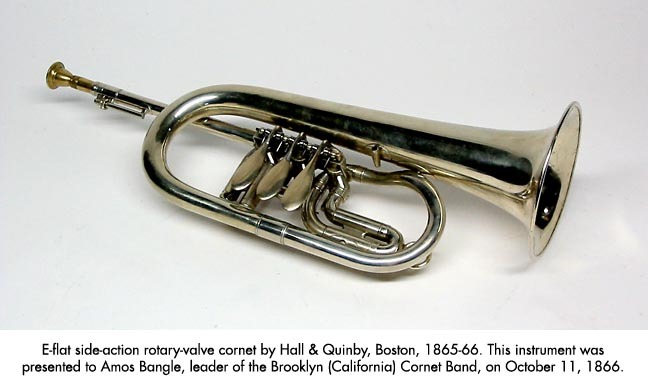 It was built in 1865-1866 by Hall & Quinby of Boston, Massachusetts, and presented to Amos Bangle, leader of the Brooklyn (California) Cornet Band on October 11, 1866. It has Allen rotary valves, an unusual design with exceptionally fast and smooth action. Intonation is excellent for an instrument of this era, and the tone is sweet and singing. It was restored by Robb Stewart. 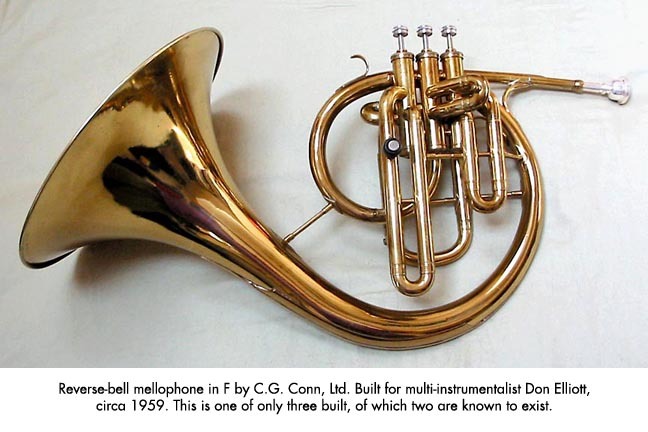 Eb Cornet: Kanstul reproduction of an 1850s Graves & Co.
Have an interesting old instrument? If you have an instrument to sell that you think might be of interest to me, please SEND AN EMAIL, or call or text 315-478-8731. All contents Copyright © 2009-2017 Jeff Stockham.